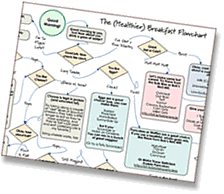 Every once in awhile I like to geek out with Microsoft Visio and put together a one-page guide that I think might be useful, complete with the requisite number of squiggly arrows. Intended to be a fun and accessible introduction on how to decipher the omnipresent Nutrition Facts panel, this guide will give you a quick overview of what’s most important. I walk you through what I look for on the label, and give a handful of useful pointers along the way. Take a look, print it out, and stick it on the fridge for everyone in the family to read. And please let me know what you think in the comments! This is not intended to be a comprehensive guide or to replace any qualified medical advice. It’s just an overview, and I’ve left lots of important stuff out. 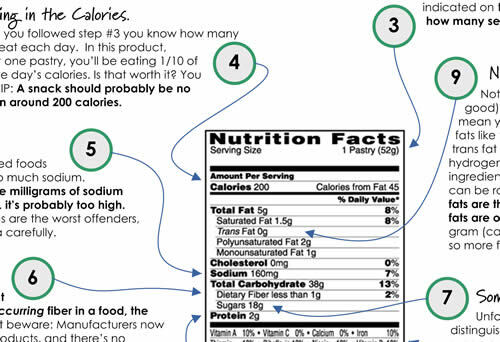 If you want to learn more, check out the FDA’s How to Understand and Use the Nutrition Facts Label. Nice job with Visio!! At least I know I’m reading the right stuff everytime I read the label. And now I know what some terms mean-maltodextrose, anyone? Thanks for the guide. Can’t wait to put it on the fridge for the kids to read!!! Thanks Stephanie! Glad you like it. Hope the kids find it interesting and useful! Please let me know if you come up with any ways it can be improved! Geek out all you want, Andrew – this is fantastic! Great for those of us who are still sneaking in the processed stuff (hello, Carr’s water crackers) now and then. Thanks Casey! (and I appreciate the tweet, too! ).